The last few weeks have been marked by the impending excitement and doom of my inter-borough move. On the one hand, I wanted to cook my way through my whole pantry so I would have one less box to pack. But on the other—that is, the lazy, exhausted hand that walked the entire length of Brooklyn looking for an apartment with a dishwasher—all I wanted to do was sit on the couch and have Charlie spoon feed me meals. 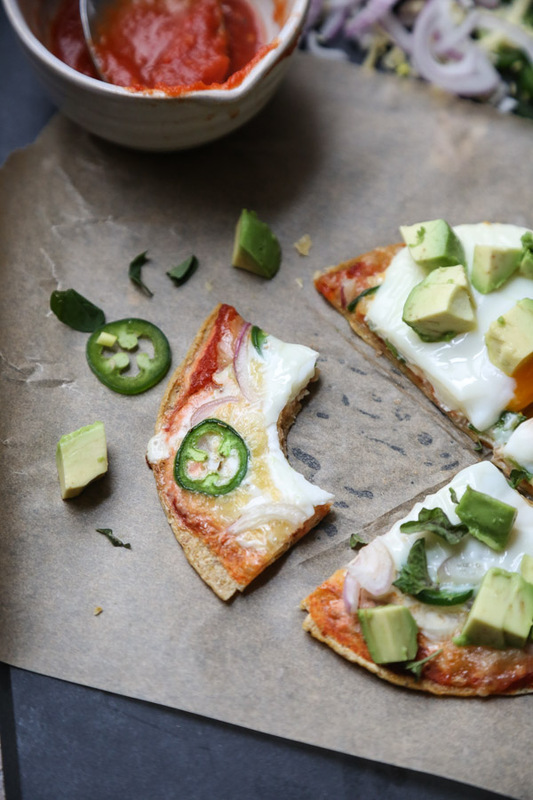 The compromise was this easy breakfast pizza recipe. It kept my hanger at bay during long afternoons of walking up and down unpromising walkups. And it disposed of some of the usual pantry suspects without my having to exert much effort in the kitchen. 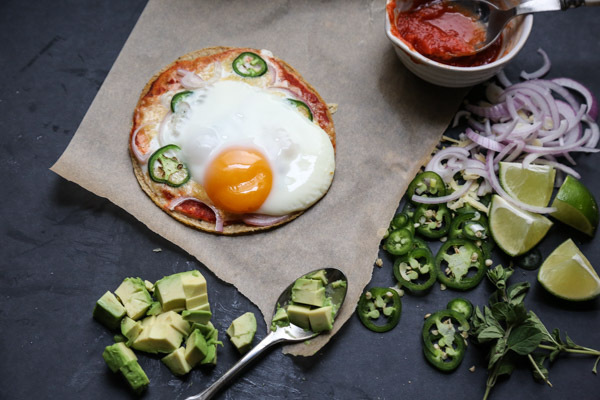 The beauty of these Mexican breakfast pizzas is that they take advantage of some fridge-related items that I usually have on hand: tomato sauce, corn tortillas, eggs and cheese. The latter doesn’t always make an appearance, but as I mentioned last week, my resolve on the cheese front has been slowly melting away this February (har har). So a few weekends ago, before heading off to Brooklyn to look at apartment number 19, I threw these ingredients together, along with some fresh shallot and jalapeno, into a tostada-style egg sandwich. I’ve always been a little intimaded by gluten-free pizza crust. Because, let’s be honest, even the best attempts pale in comparison to the real deal. 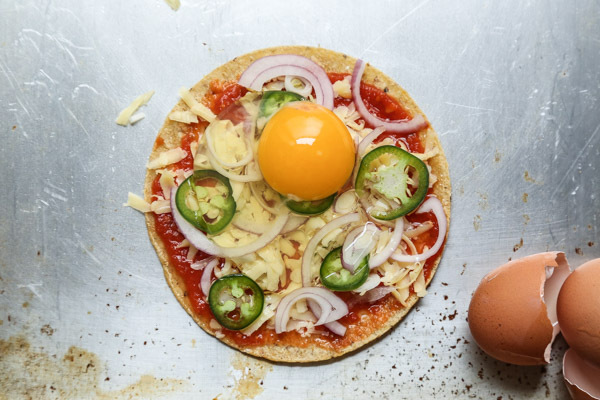 So I liked the idea of crisping up a corn tortilla on the stovetop to form a stiff round, and then simply assembling the toppings as one would a regular pizza. The whole thing bakes in the oven for just 6 minutes or so—until the cheese is melted, the egg whites are set, and the veggies have softened. If you don’t have cheese lying around your fridge, as I aspire not to in this new apartment (God and Charlie-willing), the breakfast pizzas will still be ridiculous. After all, who even pays attention to cheese when there’s an oozing egg yolk involved? 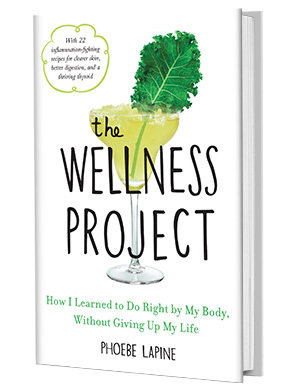 However, if you want to nail all the important breakfast food groups, and health is not at the forefront of your mind (as can happen when you’re under a lot of moving-related life stress), you can keep the cheese AND add bacon to the mix. Maybe even diced chorizo for some Mexi-vibes? 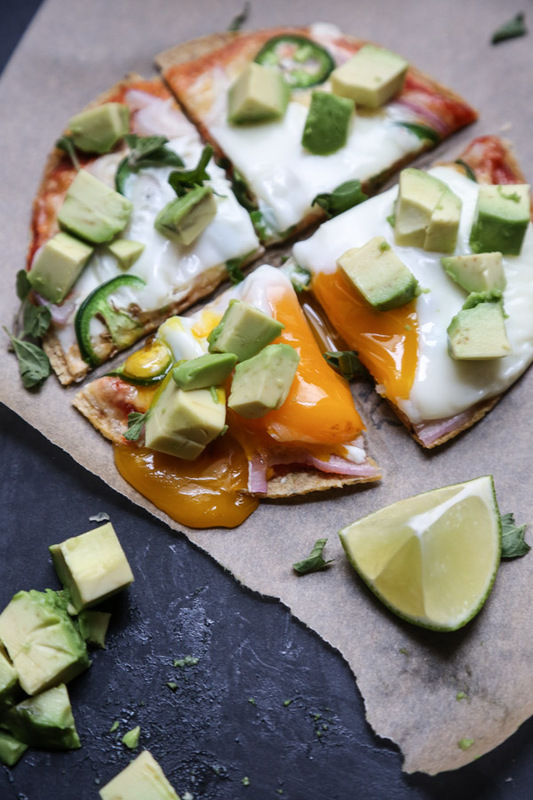 In addition to being delicious, these breakfast pizzas turned out to be a good luck charm. Our first stop after eating them was the apartment that I am currently sitting in. Having a belly full of egg and cheese might have tipped the scales. But after this weekend of fully unloading the remains of my pantry into the new kitchen, I can officially say, with no avocado running through my veins, that this new space is a dream come true. Well worth the wait, and the weight in egg and cheese that sustained it. I can’t wait to share a full sneak peak of the new digs later this week! 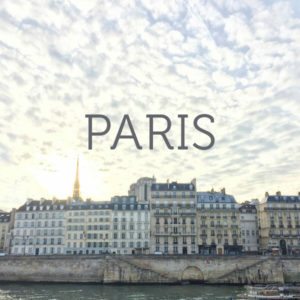 In the meantime though, you can catch me on snapchat (plapine) and instagram for some informal glimpses. 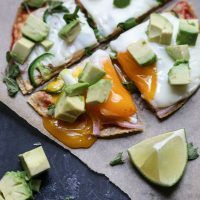 And even if your future doesn’t involve a change of address, I have a feeling these easy breakfast pizzas will be just the thing to warm your home, new or old. 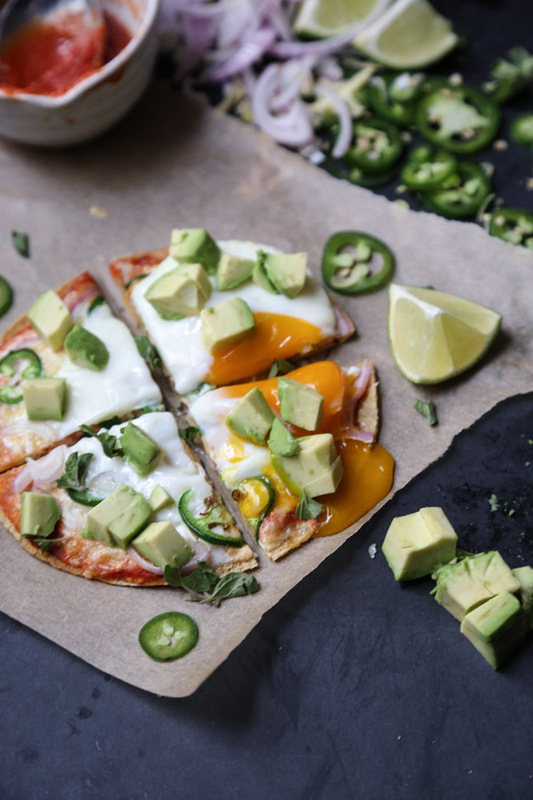 This gluten-free Mexican breakfast pizza recipe is so easy and versatile. 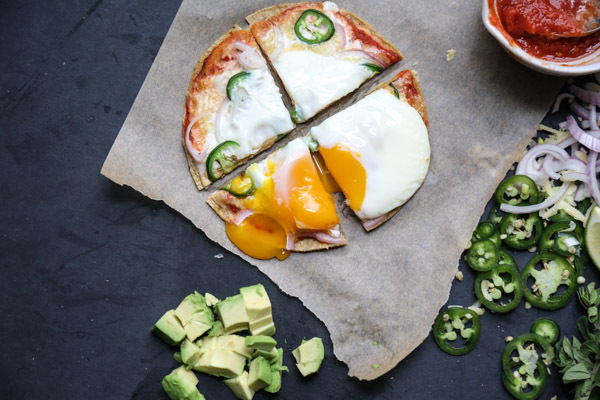 Corn tortillas topped with egg, jalapeño, and avocado - all your taco favorites. Arrange the tortillas on a baking sheet and brush the tops lightly with olive oil. Heat a medium skillet over a high flame. 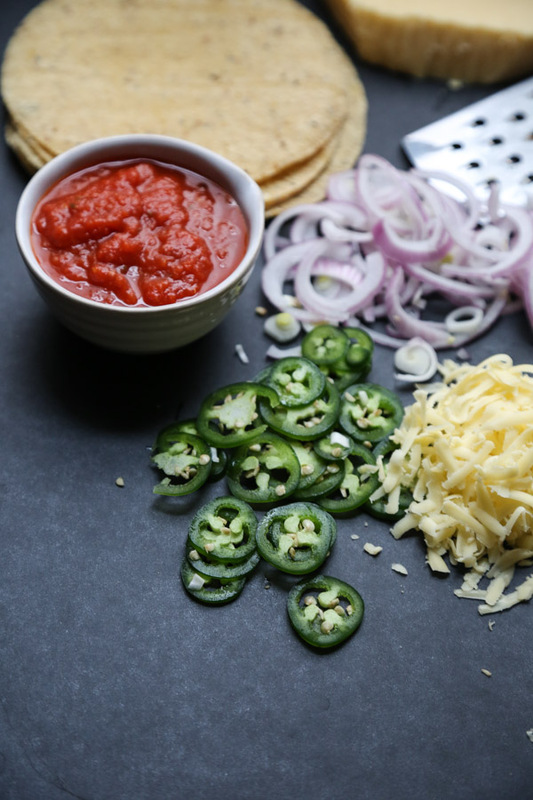 One at a time, cook the tortillas oil-side down, flattening with your spatula if the edges curl, until beginning to brown on the bottom, about 1 to 2 minutes—when you pick them up with your spatula they should be a flat, stiff round. If still pliable, cook a little longer. Remove to the sheet pan and repeat with the remaining tortillas. Add a heaping tablespoon of sauce to each tortilla and spread evenly, leaving a little edge to imitate a pizza crust. 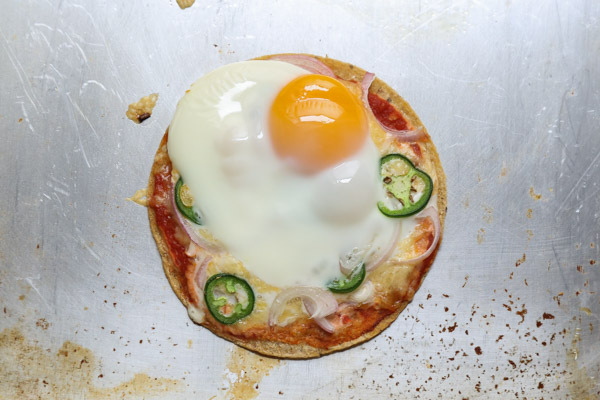 Top with the cheese followed by the jalapenos and onions—try to leave a little topping-less pocket in the center to give the eggs a well to settle into. 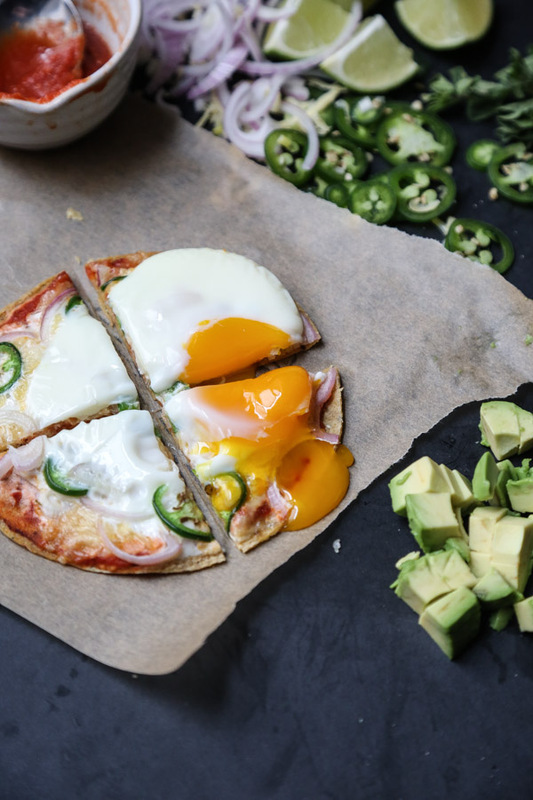 Crack an egg on top of each tortilla, doing your best to pile the white and yolk into the center. Season with sea salt and pepper. Carefully transfer the sheet to the oven and bake in the oven for 6-8 minutes, until the egg whites are set but the yolk is still wobbly. 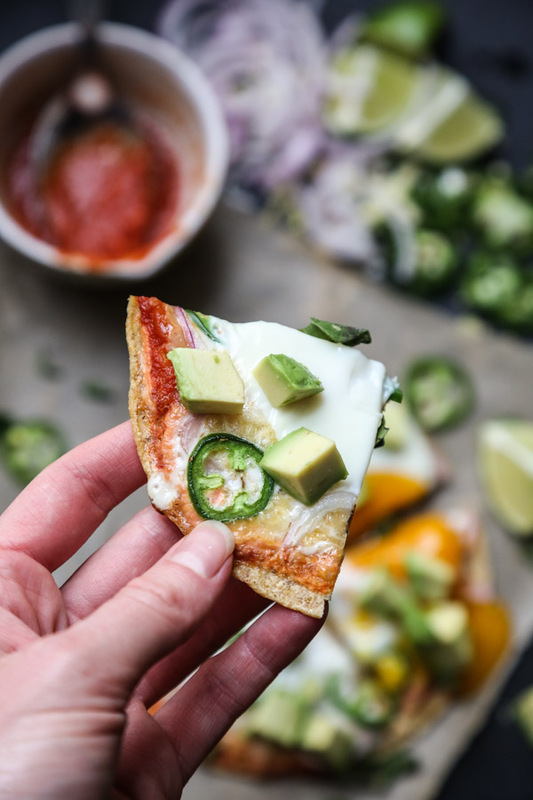 Top each individual pizza with the diced avocado and cilantro (if using). Serve alongside lime wedges. What a great breakfast – a super way to start the day. Best of luck to you in your new home. Moving can be hard work, but once you are all organized, settled, and cooking in your new home, you’ll be thrilled! I’m sure you’re right Adri!! I’ve already christened the stove and it’s wonderful. 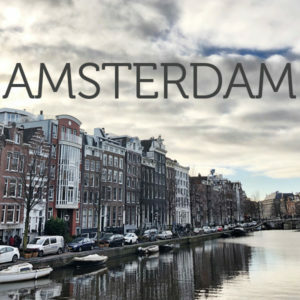 So great to read that you guys found your new home! We put a hold on it during the winter and are now again on the lookout (cross your fingers, there are very few options, as people don’t move due to the economic disaster here, so very few apartments are available). Our best wishes for your new beginning guys! Bug hugs from both of us! yum! love these additions Heath!